It’s hard to be little. The world is geared for grown up, not little ones. Their legs are too short, their arms are too short. It’s just plain frustrating. Times that should be fun, such as meals or coloring at the table, can be hard on them. Too big for a high chair, too small for a normal dining room seat, tired of sitting on phone books to reach. In an amazing invention, that has remained unchanged since 1972, Tripp Trapp changed the mealtime game. This chair grows with your child. And when I say that, I mean it. The Tripp Trapp chair can take your child from birth (with the new optional Newborn Set) through infant (with the optional Infant Set) straight through the college years and beyond. 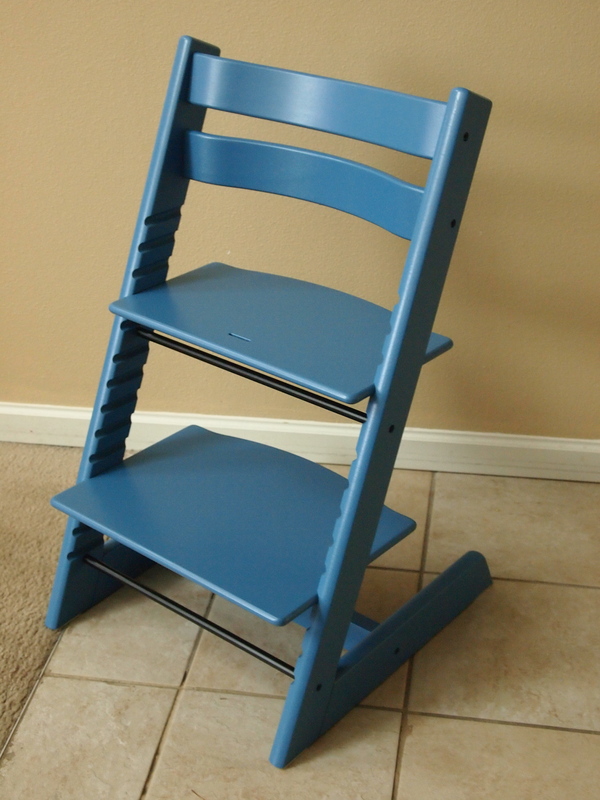 The Stokke Tripp Trapp is built to last as long as it will fit. It is made from solid wood, in a rainbow of colors and wood stains. Both the seat and foot rest of this chair are adjustable for the perfect fit for YOUR child. Long legs and a short torso? Done. Short legs and a long torso? Done. 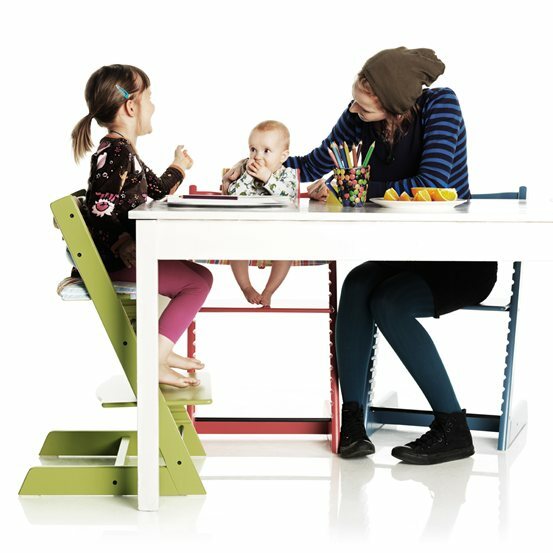 The Stokke Tripp Trapp has the ability to fit any child, at all ages. What really makes this chair stand out to me, is it’s ability to support all children, even those with special needs. The incredible versatility means that little tired or restless legs have a place to be secure. Children who have a hard time in a regular chair due to low tone issues will find the curve of the back a place to be supported. If more support is needed, the Stokke Tripp Trapp also comes with straps for more security. This chair is perfect for therapy time or ABA. Having one chair that can adjust to various heights needed for different therapies can help provide a sense of security for children as well. It’s always nice to have something familiar when working hard on new tasks. The Tripp Trapp® chair, created in 1972 by the designer Peter Opsvik, has never been bettered. In 1972, revolution was a fact. Back then no one had seen anything like the Tripp Trapp®, and almost 40 years later it is still unique: the only child’s chair that can take you from baby to adult, keeping you secure and comfortable all the way. The Tripp Trapp® designer’s inspiration came from watching his own young son, Tor, struggle to find a comfortable position to sit in at their family table. Having grown out of his old-fashioned high-chair, but still far too small to sit on an adult’s chair, Tor was left dangling his legs and struggling to reach the table. What do you do when your feet don’t reach the floor and you can’t shift your weight when you feel the need? Well, you can’t move the chair down to the ground, because then your elbows won’t reach the table. So how about moving the floor up to meet your feet? That’s what the Tripp Trapp® does, by providing a stable footrest that supports a child’s feet and allows it to sit at the correct height, its elbows inheight with the table, in comfort and security. Then there’s the problem of your upper body not being supported because the back rest is too far away. The Tripp Trapp® chair’s unique depth adjustability solves that one, meaning that no matter how big or small your baby, his or her feet and back can be perfectly supported. Not only does this chair grow with your child, it can adjust to custom fit your child’s body, enabling comfortable and natural ergonomic sitting. Sounds like a pretty sweet chair!